I love gin and one of my favorite gin drinks is a dirty martini. Mixed with the right amount of gin, a splash of vermouth, some olive juice and about 4 olives. That might seem like overkill on the olives, but I normally get extra olives for two reasons: I love the manzanilla olives and their flavor after soaking in gin and my wife always steals them when I’m not looking. Some years ago, I was out with friends and saw a dirty martini on the drink menu. 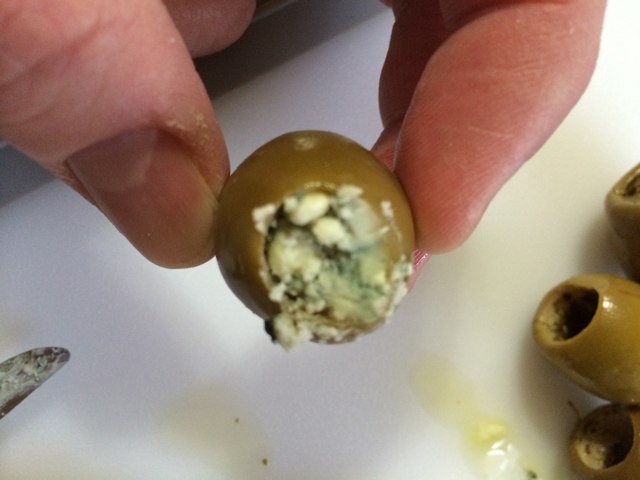 The difference that caught my eye was “bleu cheese stuffed olives.” I had to try it. It ended up being so good. So the next time I went to the store, I found a jar of the Mezzetta brand and decided to try them. They were good, too. So the obvious next step was to make them myself. On the other side of the olive bar at the grocery store is a cheese bar. 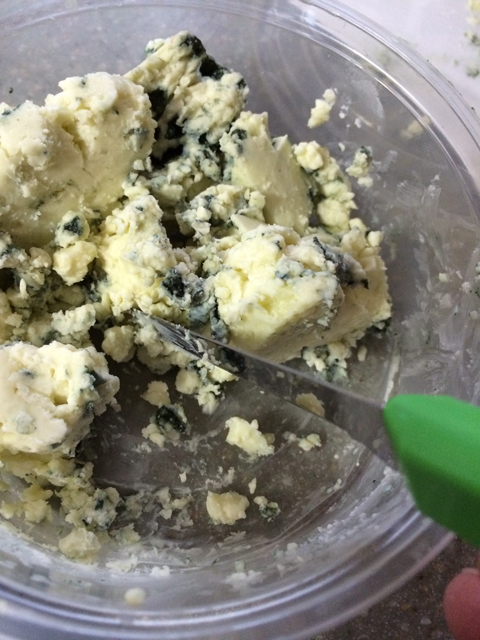 I purchased a small bit of bleu cheese, using some for the stuffed olives and the rest to top my salads. 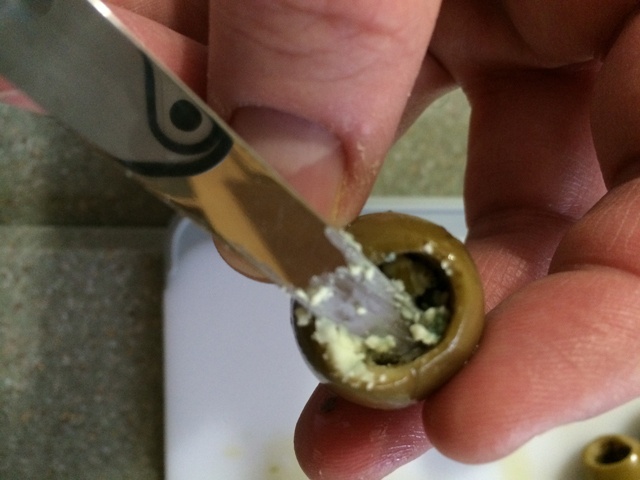 I used a small paring knife for the smaller blade that fits into the olive without cutting it open, leaving the olives structure intact. 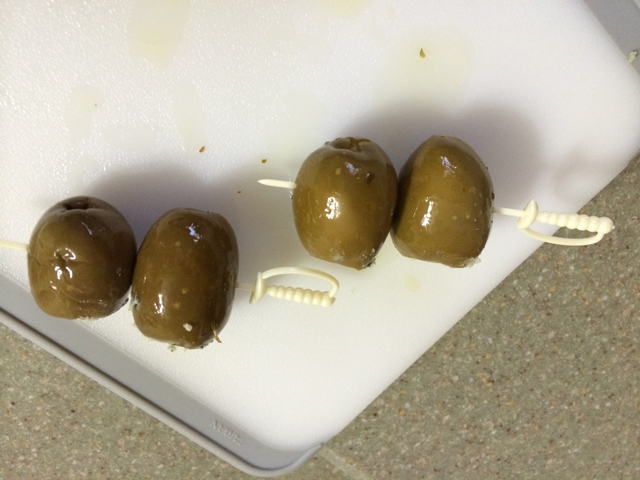 Carefully, I took small bits of bleu cheese and pushed them into each olive. 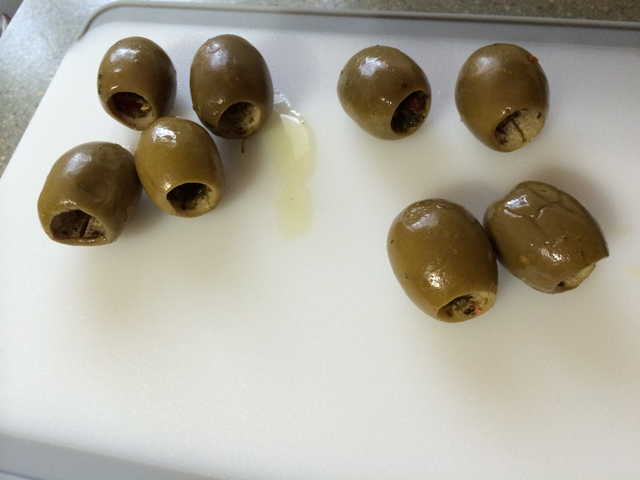 This took the longest time as I wanted to again be careful not to slice parts of the olive. I repeated this step until I filled the entire olive with bleu cheese. Note how it’s flush with the opening, just slighting sticking out. 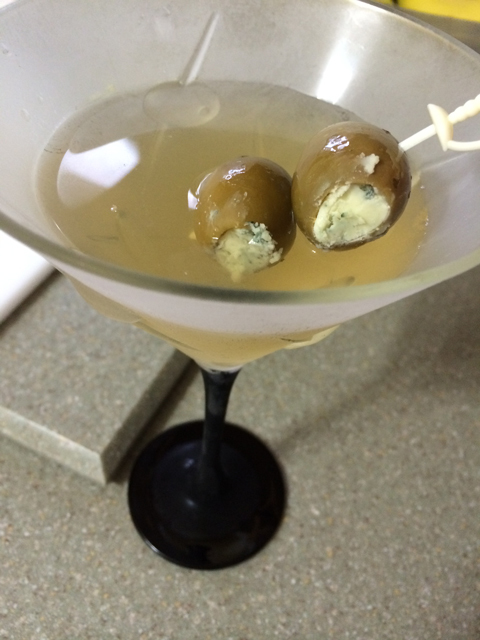 The last thing you want is stray bleu cheese floating in your dirty martini [I cleaned off the excess bleu cheese from the olives before serving]. The flavor and taste of the olive is after it’s had time to have gin soaking in it and you eat them between sips of the drink. All lined up and ready to be used in dirty martinis. I chilled the martini glass for about 15 mins before serving. Not too cold, but just enough frost on the glass to make it not only look good, but have a cold glass to pour the shaken gin, vermouth and olive juice in. 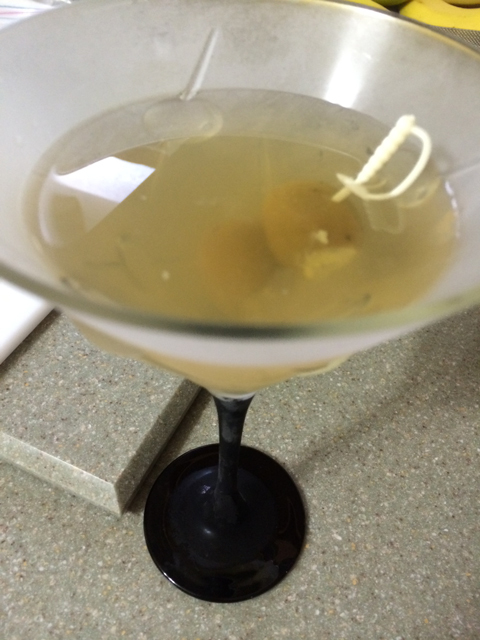 For this particular martini, I used Hendrick’s gin. Bombay Sapphire works quite well in dirty martinis. 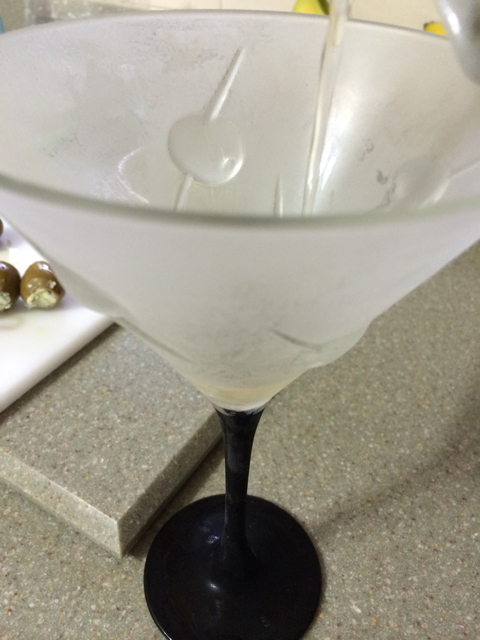 And there were have a finished dirty martini with bleu cheese stuffed olives. 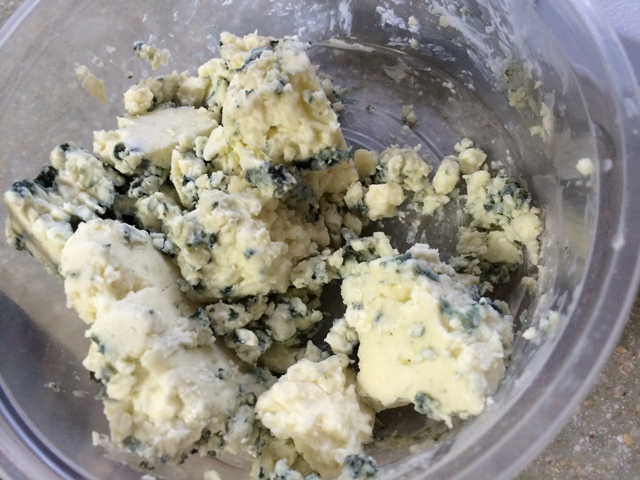 I would imagine you could use any cheese you want, but bleu cheese goes very well the alcohol properties. Next time, I will get some Gorgonzola cheese and stuff some more olives for a flavor addition. Nope. Can’t do it. I hate olives. 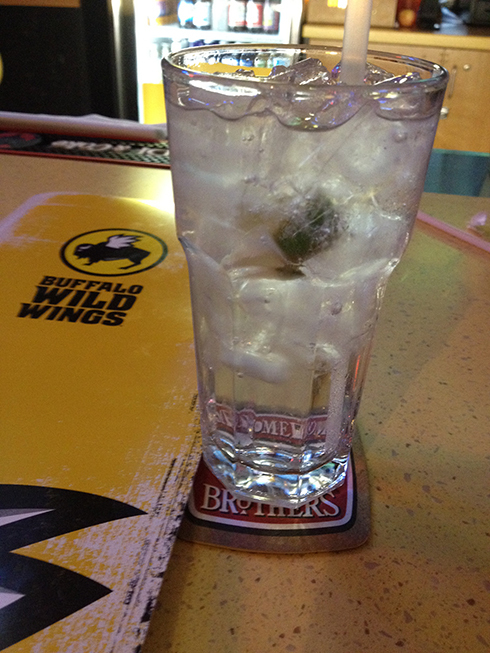 I don’t mind the flavor they add to a martini but I won’t end up eating them. Lots of martinis is a good thing. Cheers and thanks for visiting/reading.